With this week’s offer from Rewarding Times we are offering you a luxury 2 night night stay for two in a superior room with high tea on arrival (Homemade Scone Plate), 2 course meal in the fine dining Herbert Restaurant plus late check out to 2pm. 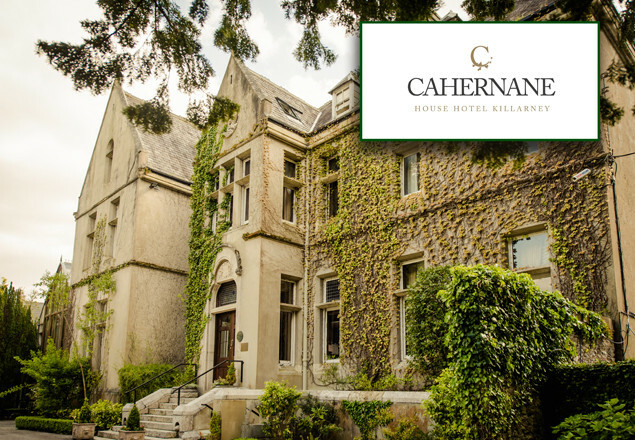 Beautifully situated on a private estate on the edge of Killarney National Park, Cahernane House Hotel is located just ten minutes' walk from Killarney town centre. The entrance to the hotel is framed by a tunnel of greenery which unfurls to reveal the beauty of this imposing house, constructed in 1877 and formerly home to the Herbert Family. The Herbert Room Restaurant, with 2 AA Rosettes awards, offers cuisine from a daily-prepared menu using the very finest of fresh local produce, blending Irish tradition with continental imagination. This is complemented by a wide selection of impressive wine & local craft beers, which forms an attractive backdrop to the atmospheric cellar bar. This offer is available from 14th March to 26th of June inclusive.